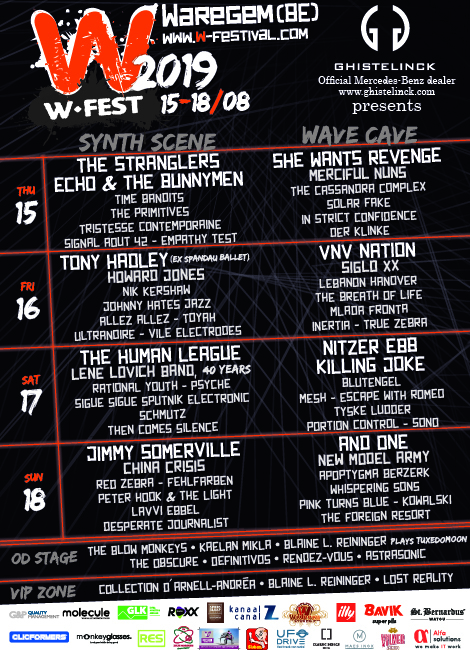 W-Festival, the Belgian New Wave & Synth Pop summer festival – Celebrating The New Wave of life! Herbeleef het beste de jaren ’80 op en rond de site van Waregem Expo van 15 t.e.m. 18 augustus. Met The Stranglers, Tony Hadley, The Human League, Jimmy Somerville, She Wants Revenge, VNV Nation, Nitzer Ebb, And One, Echo & The Bunnymen, Killing Joke en vele anderen.